We wanted to come up with an easily recognized, fun family group costume idea that our 6 year old twin boys would like and our 18 month old daughter would actually wear. We also wanted something sort of simple to pull together, but something we could still add some flair to and of course we love to DIY so store bought costumes were out of the question. 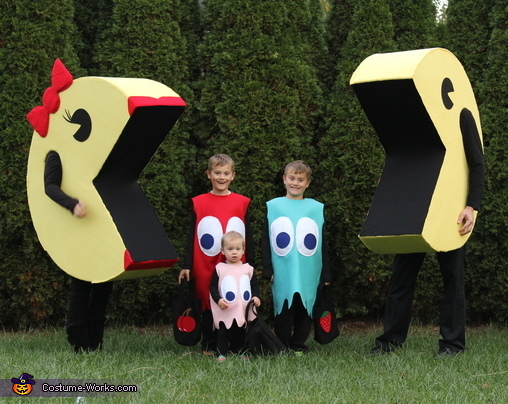 After we sifted through a bunch of ideas and briefly toyed with just having the kids dress up, we landed on a family Pacman theme. The most expensive part of our costumes were the rope lights--about $20/set. Other than that we spent about $50 on fabric and got the boxes for free. We had the best time walking around our neighborhood and got stopped for pictures quite a bit. Yeah for Halloween!